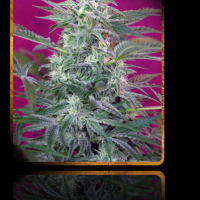 Cream Mandarine Auto female Seeds produce a cannabis plant with Autoflowering genetics and a flowering time of 9 weeks. 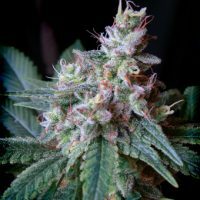 Cream Mandarine Auto female Seeds has a genetic makeup of Cream Caramel Auto x Ice Cool and would make an excellent addition to anyones seed collection. 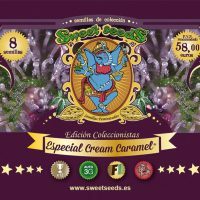 Buy Sweet Seeds Cream Mandarine Auto female Seeds at the lowest price online now! Feminized and non-autoflowering version with an ultra fast flowering of one of the most sweet and aromatic strains of Sweet Seeds catalogue. This genetic is a hybrid resulting from the cross between a selected genetic line of S.A.D. Auto and a Black Domina elite clone selected in 1998. The cross between the autoflowering genetic and the non-autoflowering clone produces non-autoflowering F1 Hybrids and shortens flowering time by one week. A strain with very dense buds and a big resin producer. The aroma of this strain is exquisite, very sweet and musky, typical of some Old School Afghan plants.